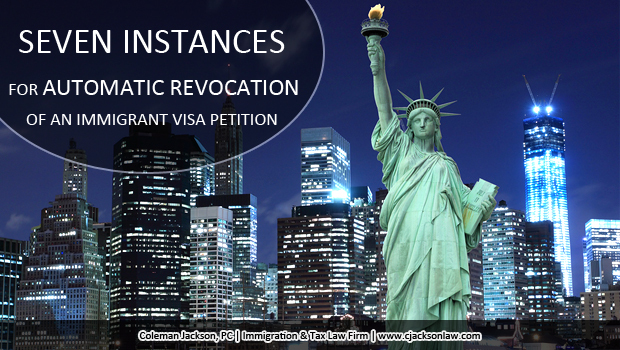 When an Immigrant Visa Petition is automatically revoked under the United States Immigration and Nationality Act (INA)? Even if approved there are certain events or circumstances that terminates an immigrant visa petition whether it relates to an United States Citizen or Lawful Permanent Resident petitioning for an alien relative under 8 C.F.R. §205.1(a)(1)-(3). Under the INA an automatic termination relates back to the date the immigrant visa petition was originally approved. There are no grandfather provisions under the INA when an immigrant visa petition is terminated automatically. If the petitioner files a voluntary withdrawal notice with the USCIS office adjudicating the petition. If the petitioner dies while the immigrant visa petition is being adjudicated by USCIS; unless, the humanitarian rules apply under the INA that relates to a widow(er) of an U.S. Citizen petitioner. The immigrant visa petition could be reinstated for humanitarian reasons in the case of a widow(er) married to a deceased United States Citizen Petitioner. If the beneficiary of a lawful permanent resident immigrant visa petition marries before receiving their Green Card. That means that sons and daughters of lawful permanent resident petitioners must remain single because a marriage event automatically terminates the immigrant visa petition of an LPR’s son or daughter even if the immigrant visa petition has been previously approved. If the lawful permanent resident petitioner legally looses their Green Card status while the immigrant visa petition is being adjudicated by USCIS. The LPR naturalizing or becoming a United States Citizen is an exception to this ground for automatic termination of an immigrant visa petition. If the petitioner files for and legally completes an official court ordered divorce decree while the immigrant visa petition is being adjudicated by USCIS. In order for a divorce to terminate the immigrant visa petition, it must be a legal divorce or separation, not merely, a separation of the spouses. However, although, mere separation and filing divorce does not automatically terminate an immigrant visa petition; such events could very well effect the USCIS adjudicator’s assessment of the bona fides of the marriage. Termination of an abusive marriage does not terminate a self-petition, such as, VAWA, U Crime Victims Petition or T Visa Petition. If the petitioner fails to pay the immigrant visa petition filing fees within fourteen days of receipt of an USCIS notification that such fees are due and payable. Proper filing fees should be attached to the immigrant visa petition upon submission of the petition to avoid this administrative ground of automatic termination. If the self-petitioner or beneficiary dies while the USCIS is adjudicating the immigrant visa petition. This blog is written by the Immigration & Tax Law Firm of Coleman Jackson, P.C. It is for informational and educational purposes and does not create an attorney-client relationship between this law firm and the reader. If you have questions about your particular situation regarding federal or state taxation or immigration matters, you should consult with independent legal counsel with respect your individual situation or circumstances. This entry was posted in Family Immigration, Family Immigration Petitions on July 15, 2015 by Coleman Jackson. Resident immigrants of the United States of America can claim the foreign tax credit for eligible foreign taxes paid or accrued to any foreign country or U.S. possession during the tax period pursuant to 26 U.S.C.S. § 901(b)(1). Internal Revenue Code §901(b)(1) states that any income, war profits, and excess profits taxes paid overseas are creditable against U.S. income taxes. The U.S. Treasury and U.S. Supreme Court has interpreted §901(b)(1) to mean that a foreign tax is creditable if its principal nature is that of an income tax. 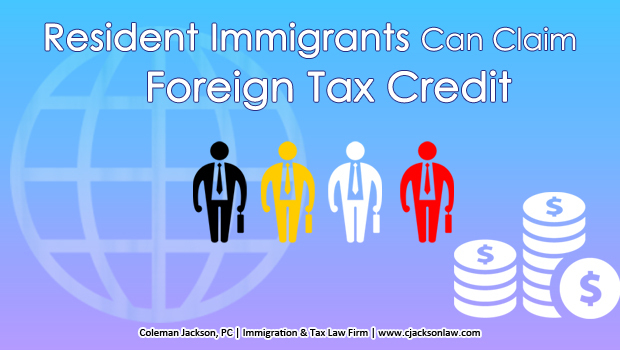 Non-resident immigrants are not eligible to claim a foreign tax credit, but for, a very limited number of circumstances. The general rule stated above as far as resident immigrants’ eligibility to claim the foreign tax credit is not limited to resident immigrants; U.S. citizens and domestic corporations could also be eligible to claim the foreign tax credit if they paid overseas taxes to a foreign country. Determining creditable and deductible payments that firmly fits within the U.S. meaning of income taxes paid to a foreign country can be a very complex international tax matter. This entry was posted in Offshore Assets and Accounts Disclosure, Taxation on July 3, 2015 by Coleman Jackson.